A favorite and easy Malay food recipe. 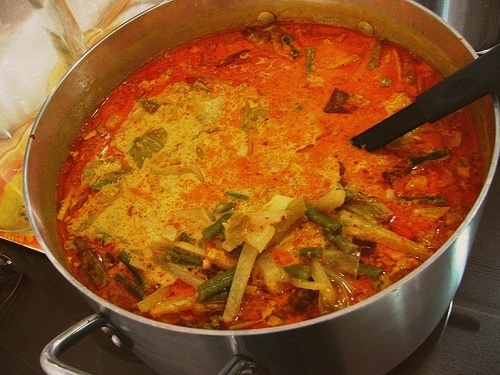 Sayur Lodeh is delicious and healthy. Chop all the spice blend ingredients and add them to the blender, except the chilli powder. Blend it into a paste. Combine coconut milk and water to form "thin coconut milk". Cut all the vegetables into small cubes and sticks. After all the spices are blended, add chilli powder according to your tastes. Fry it in oil till the oils in the paste ooze out. Don’t burn it. Add thin coconut milk and bring it to a gentle boil. Dump in all the vegetables and tofu and simmer it till the vegetables are tender. Add salt to taste. Serve Sayur Lodeh with hot rice. Still, love the recipe! Thanks for posting! Thank you for sharing it. I will try to recreate something my Oma used to make!